Tower loudspeaker with powered 12 inch subwoofer. This has to be one of the best sounding speakers Ive heard. The towers are unlike any other they have a 12 inch sub with a 200 watt amplifier each. Thats 400 watts of pure hard bass. 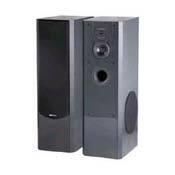 I have a pair of these towers and I cant even put one sub on bc the neighbors will call the cops on me. There is this neighbor that told me that her window shakes when i put them on and shes like 50 feet away from me.Ive had these for more than a year and they still sound like new. These towers is all the power you need for your home and the surrounds and center to go with it and you'll never have to go to the theatre. These speakers are incredible. My whole HT system is BIC america speakers, and you will not find a better system for the price anywhere. With these DV-5312 towers, they come with a 12" resonator built in the side, UNTIL you install the D-200 amp yourself (VERY easy). With the amps in, the bass output is just amazing, i have never heard anything like it (at THIS price!!!) while watching a movie AND listening to music. I am a distributor for BIC speakers and can sell them to anyone, and i HIGHLY recommend thses to anyone. I was always afraid to really test these subs out because if i blew one, i would have to replace the whole speaker (i think), but one day i got crazy and just CRANKED these things (with the amp volume up all the way) at 70 on my receiver (its max is 80) and my basement walls shook, and even my couch vibirated (i was on concrete). I have people who can vouch for this. Overall PERFECT front speakers for anyone. **BIC america DV-62CLR center channel (read reviews on this speaker!! It is all 5 star! **BIC america DV-62si bookshelf speakers (surrounds)-reviews say "voted best for accuracy over pairs selling up to $700/pr.!!" This combo of speakers is the ultimate.